Have you seen Sarah's awesome new new feature coinciding with her spending hiatus? Yea well, she's genius, so I'm totally stealing it... Sarah I hope you don't mind, but imitation is the sincerest form of flattery, right?? But I didn't buy it. Aren't you proud? great post. yesterday i was in ross and passed by a $10 adorable sweater dress. it was cheap so i tried to justify it, but in the end i remembered the price doesn't matter on a hiatus. happy i got that off my chest! nice work. I'm still just patting myself on the back for "nearly" making it through a week. 3 months is going to be interesting. Great will power. For what it's worth, I am a big fan of the Amazon Wishlist. Now it's universal. So, I add the "must haves" (so I think) to the wishlist and take pause. I am not on the complete spending hiatus you lovely gals are doing. I wish I could. But this is a little tool that is helping me curtail the items I would normally click and ship. Good job Joslyn! Keep it up! Last night I was at Target and couldn't help but check out the kids' clearance rack. They had such cute sweaters, dresses, you name it for only $2.50!! I couldn't believe my eyes. Let me tell you, it was not easy, but I marched right out of there without buying any of them. love the tote-gets me thinking about Spring which is so welcome as I'm sitting here freezing! Hmmmm... so if the LLBean tote is getting a bit long in the tooth, as it were... how about a little refurb? 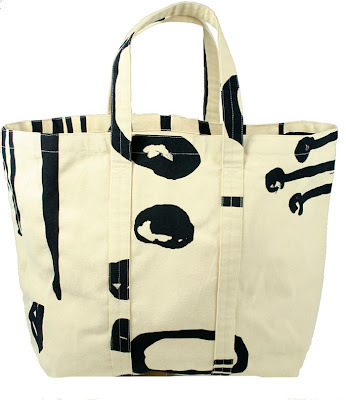 Maybe a little fabric paint or patch applique to make it your own 'new' and so incredibly modern looking bag? Wow! I'm so impressed, because that tote is so yummy and cute! What good work! So inspired by you resisting the temptation of such a beautiful tote. yeah weee, I love his idea. Yes, it is the perfect bag, it is just so adorable that you must be much stronger than I am not to have bought it, I am very happy with this idea though, looking forward to see what else you aren't going to buy.